Portland, OR - You know it’s Spring when the Portland Farmhouse and Wild Ale Festival comes around for it’s 3rd and freshest year yet with more than 70 different beers, artisan cheese, charcuterie and pickles. Taking place Saturday March 28th and Sunday March 29th at Saraveza Bottleshop & Pasty Tavern, outside along N. Michigan street and in the Bad Habit Room, this years festival has the grandest selection yet of saisons, barrel-aged, fruit, herb, spice and wild yeast inflected beers. Expect more than 30 beers on tap at one time at multiple stations with more than 70 beers total rotating in as kegs run out. Bottles of Upright Farmhouse Festival Reserve will be available for purchase on Sunday 3/29 for FESTIVAL ATTENDEES ONLY. Tickets for bottles will be available at the door when we open at 11:AM. Tickets are a limit of one per person and are $15 CASH ONLY. You may then redeem your bottle starting at 2:PM and we'll be tapping a keg of the beer at 1:PM, so you can try the beer right away! This years festival features an expanded outdoor area with booths for Cascadia Creamery, Olympia Provisions and Saraveza’s kitchen pickle plates. Festival attendees can snack and pair their beer with locally made and crafted foods as well as purchase a Cheese, Charcuterie or Pickle Plate or hot dogs. Cascade Creamery and Olympia Provisions will also offer their fine products available to-go. The Ale Apothecary will have their own booth both days of the festival with bottle pours and the debut of a brand new hoppier beer line called “Carpe Diem Mañana” as well as their Sahalie and other even rarer bottles. Block 15 Brewing and Agrarian Ales will share a booth on both Saturday and Sunday pouring up to 3 different rare beers each. Almanac Brewing will be featured at their own booth both days of the festival featuring the debut of their new “Farmers Reserve Strawberry” along with four other saisons and sours. Crooked Stave Artisan Beer will debut new distribution in Oregon with a booth operated both days of the festival and rotating between six different beers including their “Nightmare on Brett Port Barrel aged” as well as Cassis, Wild Sage and Noir beers. To kick-off each day of the festival, Bad Habit Room is hosting a Brewer's Brunch on Saturday, March 28th and Sunday, March 29th. A brewery or two will be highlighted at each breakfast with a brewer there to discuss their beer and chat with customers. Breakfast starts at 9:30am. This breakfast is Advanced ticket-only and has limited seating. pFriem Family Brewers will debut their first barrel-aged and sour beers, a Flanders Red and Flanders Blonde. Follow Portland Farmhouse and Wild Ale Festival on Facebook for tapping updates. Pelican Brewing has sent us two rare barrel-aged kegs “Nector Sectorr” a Chardonnay Barrel Aged Saison with Nectarines and “Queen of Hearts” a Gin Barrel-Aged Saison. Oakshire Brewing has busted out rare wild ales “Hermanne 1882” a barrel-aged brett saison with wine grapes, “Admiral Raspberry” a sour Framboise-style beer and “Oude Bes” a Flanders Red with Strawberries and Balsamic. 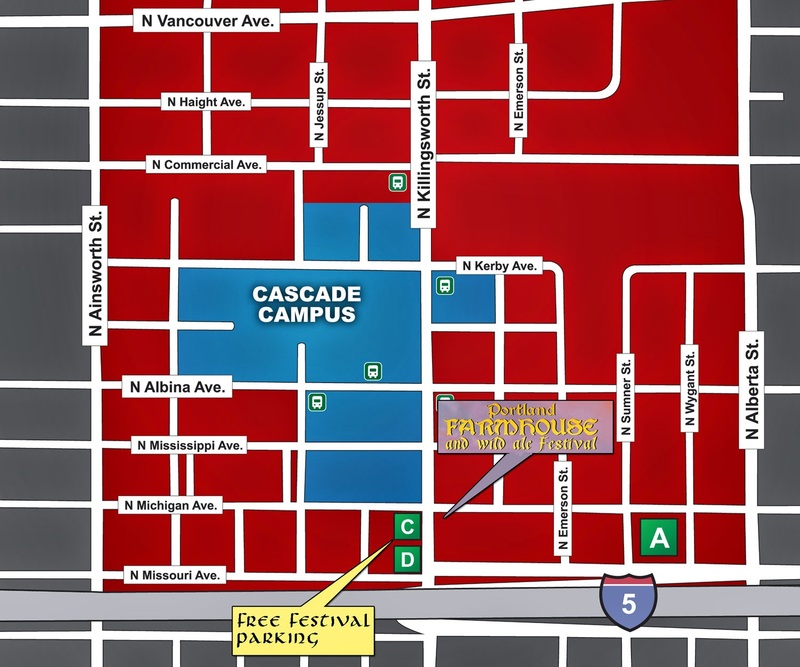 First come, first serve off-street parking is available in PCC Cascade Parking Lots C & D, on either side of the Telephone Exchange Building, located at 1011 N. Killingsworth Street, directly across from Saraveza during festival hours. #72 & #4 bus lines run right to the Festival/Saraveza and the MAX Yellow line N. Killingsworth stop is just a few blocks away. 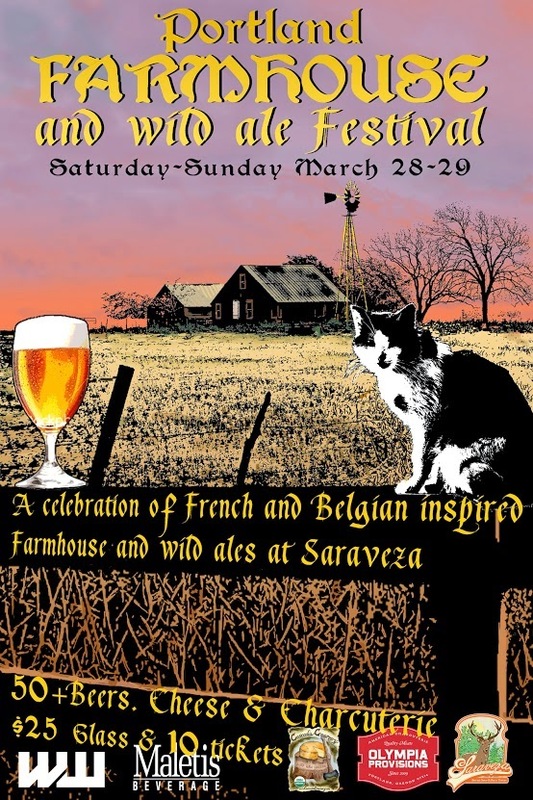 WHAT: 3rd annual Portland Farmhouse and Wild Ale Festival presented by Saraveza, Willamette Week and Maletis Beverage. Block 15 - ????? TBA ????? ?